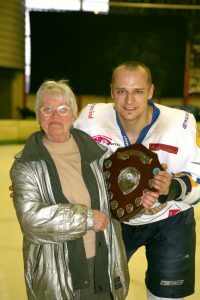 The Raiders organisation were stunned to learn of the passing of the incredibly popular former player Andrej Sporina when on Monday 18th of March we received a message that he had recently lost a relatively short battle with illness. “Sporro” was immediately taken to the hearts of the Gold and Blue when in 2006 he decided to make his brief stay at Chelmsford into a long term stay at Romford. His hard (but fair) hitting, powerful skating, prolific points scoring but mostly his 100% effort quickly earned him a place in Romford Raiders folklore. Sporro made his debut on 2nd December 2006 against Peterborough Phantoms, picking up an assist before scoring his first goal the following day against Guildford Flames. Sporro was the top points scorer for Romford in 2007/08 scoring 38 +52 for 90 points, as one of the “Three Amigos” with fellow Slovaks Erik Bochna and Pavel Valko. Their exploits over that season are certainly still the highlights in many Raiders fans hockey lives. In his 3 seasons at Romford, he made a total of 131 appearances, scoring 78 goals (including seven hat tricks) and 125 assists for a total of 203 points, which see him ranked 23rd in Raiders all-time scoring. An impressively popular character off the ice, with a friendly word and a big smile for all that approached him, he has passed far, far too soon at the age of 38. We offer our sincere condolences to his family and wish him a peaceful rest from his recent health issues.